For Gannets, It Pays to Follow (When Looking for a Meal)! (August 13, 2014, The Auk: Ornithological Advances)—Seabirds, as all birds, must breed on land. 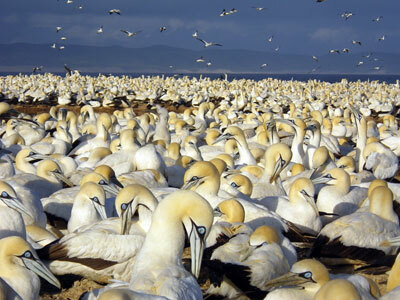 Cape Gannets, in Southern Africa, nest in dense colonies, but when they leave to forage at sea, they must find inconspicuous and patchily distributed fish. Thiebault and colleagues used GPS devices and video cameras directly attached to the birds to observed that Cape Gannets interacted with their conspecifics while searching for prey. When crossing the trajectory of other gannets, foragers often adjusted their direction of flight. By doing so, they found food in a relatively short time as compared with foragers that did not encounter or react to other gannets. It seems that in gannets, it pays to follow when searching for a meal! Read the open access article at http://www.aoucospubs.org/doi/full/10.1642/AUK-13-209.1.